Diario Umbro. Un anno sul Monte Subasio tra lecci, santi e poeti (“Umbria’s diary. A year on Mount Subasio between holms, saints and poets”) and La mia Umbria (“My Umbria”), soon to be published. The ideal traveller for us is cultured, smart, a nature lover and interested in remarkable landscapes, pleasant strolls, tasty food and good wine. We can offer 100% green vacations, including transfers by electric cars, trains and bikes. Who choses My Umbria not “only” discovers Umbria, but also experiences it engaging the all five senses. Umbria is a small region in central Italy, enriched by a multifaceted historical, artistic and natural heritage. Easily reachable in a couple of hours by train from Rome or Florence, the region also houses an airport with some international flight connections. In addition to countless arts centres and timeless hamlets, Umbria hosts authentic and magnificent natural spots, from one of Europe’s highest waterfalls Cascata delle Marmore to Lago Trasimeno, the biggest lake in central Italy. Not to mention Sibillini Mountains, among the richest in wilderness in the entire Apennine mountain range, or rivers like Nera and Corvo where it is possible to go rafting, or even the major fossil forest of Europe, in Amerino. Tourism is considered the fourth cause of environmental pollution and CO 2 emission, after food, housing and transports. What impacts more regarding tourism is mobility, especially airplanes and conventional cars, which are responsible for 75% of emissions in the sector. 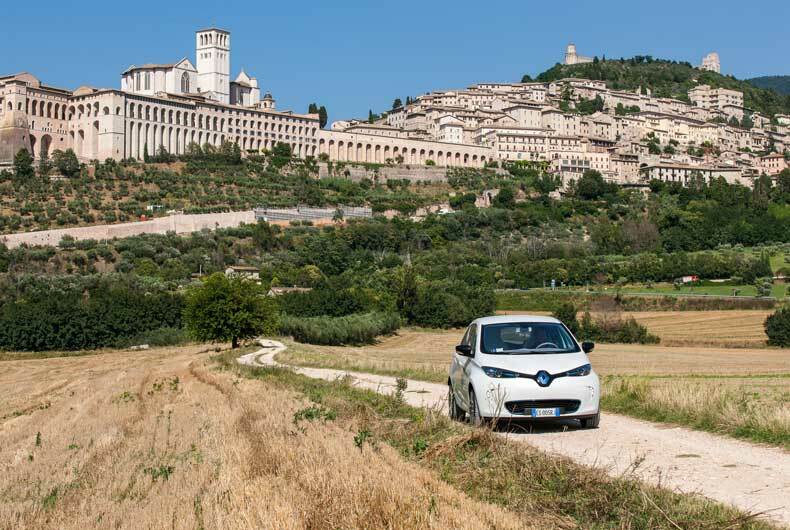 My Umbria works together with Umbria Green Card in order to offer transportation by electric car, made possible by the existing charging stations all over Umbria where you can charge your car for free. There is also the chance to lodge in green accommodation facilities. This opportunity is similarly important, as accommodation is responsible for 21% of CO 2 emissions in the touristic sector.